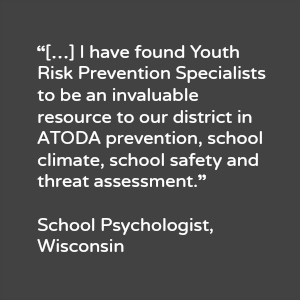 Welcome to Youth Risk Prevention Specialists. My mission is clear: I’m committed to improving the safety of our nation’s schools. I focus on both prevention and protection, by ensuring you have the resources and guidance you need. This highly effective approach is known nationwide as SafeAware©, and has been expertly developed over the past 25 years by company founder, Suzanne Sibole. SafeAware© will provide you with training, support and consultation. This covers all the core areas, including; physical safety, drills, crisis response protocols, violence warning signs, threat assessment & management, parent and staff training on suicide and violence warning signs, and best practices in bullying & AODA prevention. As you can see, it’s extremely comprehensive. 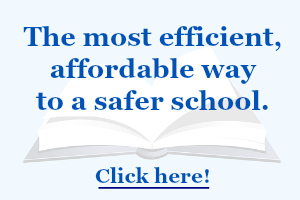 I know that for you to get the maximum benefit from SafeAware©, your school staff will need ongoing, expert support. So I provide that support until your staff members are confident: Confident they know exactly what to do and also what signs to look out for. I’m with you, every step of the way. My services are not only extremely effective. They’re also designed to be as inclusive as possible. I don’t want any schools or school districts to miss out. That’s why I have worked hard to ensure that my services will fit into your budget. In short, if you’re looking for a comprehensive, proven service that’s affordable, yet delivers the expertise you need, SafeAware© is exactly what you want. You can find out more about my services, either by clicking here or selecting the services tab in the navigation menu at the top of this page. If you’d simply like some more information, click here.